FRITTATAS.... the Italian omelette. An omelette turned into a beautiful pie. Presentation.... sometimes, it's all about presentation. Haha. But seriously, it is an Italian tradition that we all grew up with. You can put anything you have in the fridge into a frittata and it turns out great. These were especially popular in our house growing up on a Friday night during lent. 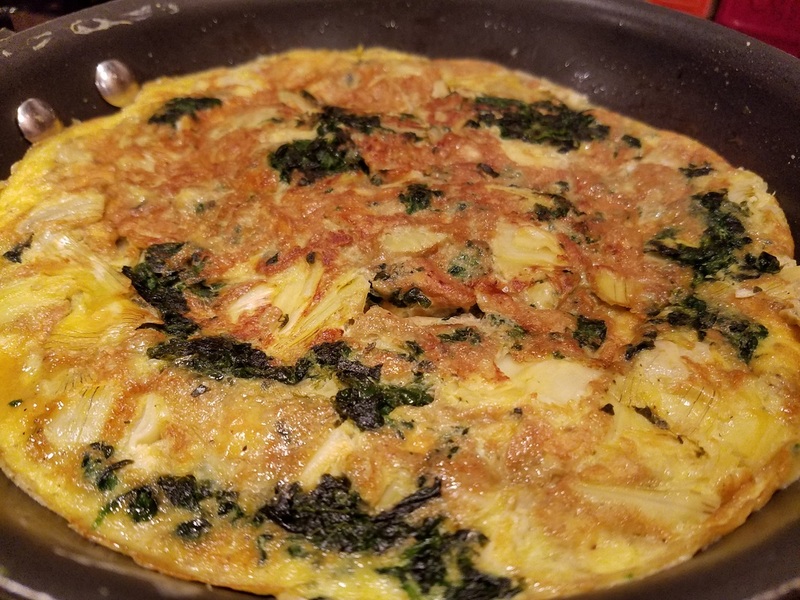 If you couldn't have meat, you had a frittata. My dad loved to have frittatas on a Friday night. Back then it seemed like we stuck to potatoes, zucchini, or peppers for the most part. Now, we throw anything and everything into them. Today, I am having my partner Lisa over for breakfast at the last minute. So, what's easier than a frittata? I would always prefer to use fresh ingredients, but all I have today is some frozen spinach and a can of artichokes....it will work. Prepare all of your ingredients. Chop your spinach, onion and artichokes and grate your cheese. Start by heating the oil in a medium saute pan. Add the onion and begin to sweat them out. Then add the spinach and artichokes. You only need to heat these though for a minute or two. Season all with salt and pepper. Put all the eggs into a bowl and whisk together with the parmesan and half of the grated fontina cheese. Slowly, pour eggs all over the top covering the ingredients. Use a fork to gently push it around to work the egg through. Let it cook slowly over a low flame about 12 minutes or until it is cooked more than half way though. You should be able to slide a spatula around the edges. Slightly lift and edge to see if is becoming a nice golden brown. When ready use a plate on top of your pan to flip over. Just be sure to do this over a sink.....just saying!! It may have happened once....haha. Now, slide it from the plate right back into the pan. It is actually very easy....you can do it!! Looking great!!! I like to top mine with some extra cheese to melt on top. Can't hurt!! And it looks beautiful!! Just let it cook all the way through on that side. Probably about another 10 or 15 minutes. Again, you can lift the edge to see the color or poke a fork through to make sure it is done. It will be gorgeous and delicious!! Lisa and I had a wonderful breakfast working on lots of great recipes and ideas to bring you next. ENJOY!! And please leave me a comment below and let me no what you put in your frittata. Get crazy! !